Today at about 11:42 a.m., State Trooper Joshua McKelligan attempted to stop a stolen 2008 Lexus on Route 24 Southbound, north of Exit 18B in Brockton after he heard a BOLO (Be On The Lookout) from Brockton Police for the stolen motor vehicle. The operator of the stolen Lexus, a 65 year-old old male, reported to police he was punched in the face and his vehicle was stolen by two individuals on North Main Street in Brockton at about 11:24 a.m. today. Several minutes later, troopers located and arrested the two 16-year-old juvenile suspects. 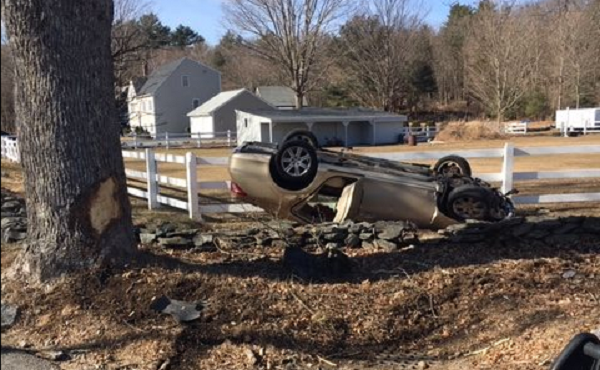 Both juveniles were initially transported to the Foxboro barracks, but subsequently transported by Foxboro and Wrentham EMS to an area hospital for treatment of minor injuries they may have sustained in the crash.